America Revealed: To Serve and Protect … Or Harass and Collect? What good are cops, really? I mean to the average, non-violent citizen just trying to go about his business? For him, cops are a nuisance – and increasingly, a threat. They don't protect his property; indeed, they spend their days trying to take it away via enforcement of various and ever-increasing laws ranging from the minor ("speeding" fines) to the major (asset seizure for possessing or imbibing some substance the State has arbitrarily decreed to be "illegal"). Or maybe they're out enforcing "free speech zones" and/or giving wood shampoos to the Mundanes (that's Will Grigg's wonderful term – full credit given here). 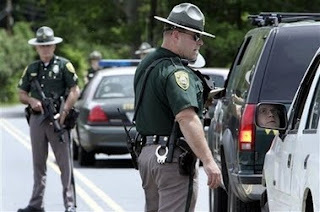 Libertarian writers such as Grigg, among others, have noted that most of us – very tellingly – do not feel "safe" when a cop rolls up behind us. Or when we see one in general. In fact we feel nervous and stressed – because we know instinctively that the cop is most emphatically not our "protector." We gird our loins, grit our teeth. We hope the cop will "give us a break" – that is, decline to fully enforce the ukase he believes we've just transgressed. We become servile, mewling "yes sir, no sir" to some buzz-cut 24-year-old community college graduate (a few have managed to achieve the full four-year degree in "criminal justice" or some such from Turnpike Tech), hating the sound of ourselves as we grovel but knowing that we must grovel, else risk our "protector's" largely unaccountable wrath. Physical protection from criminal thugs is arguably the only moral service a cop can provide. But the truth is they don't provide even this most elemental of services. Indeed, the Supremes have explicitly laid this out; i.e., cops have no duty to protect specific individuals from harm. Just "society." That means you are on your own where it matters most; the one area where most of us would agree having some back-up would be nice to have. Only, we don't have it. And more, should not expect it. There's a great saying: I carry a gun because a cop is too heavy. Another: When seconds count, a cop is just minutes away. If some SOB breaks into your home, it is up to you to provide the .45 (or double 00) enema to said SOB. Ditto when you are out on the streets. If you are accosted, the only person responsible for your physical safety – for your life – is you. So, what use are cops? They spend their days catching "speeders," fighting a "drug war" moral people are conscientiously opposed to and otherwise bothering (and sometimes, much worse) people who aren't harming anyone except possibly themselves (which in an ostensibly free society ought to be as respected a right as the right to free exercise of religion). The analogy here is the military. It is called national defense but in reality it is national offense. The last time the United States unquestionably fought a war of defense was back in 1812. The Troops – and the Cops (who are very often The Troops recycled) are there for largely offensive purposes, both abroad and back here in the Homeland. But the truth is most of the laws being enforced have very little do with keeping us from harming one another – or catching those who do. Cops are on patrol for seatbelt scofflaws; lurking behind billboards to nab ne'er do wells who travel faster than a sign says they may. Even cold-cocking jaywalkers (yes, this has actually happened). Or Tazering moms in minivans who dare to talk back. Meanwhile, child rapists on home release are not being monitored (see the Jaycee Dugard case; it's an example of the rule rather than the exception), old widows living alone are not being protected (except by themselves) and if you're out walking the street at night, you best be prepared to defend yourself. Because the cops are just doing their job – and their job has very little do with protecting you from physical violence. But they'll be sure to investigate whatever happens to you after it's all over with. Plenty of overtime pay, there.